When I first came along this square called Servitenplatz, I really was surprised. Somehow I did not expect such a cosy and neat little place in a big city like Vienna. Servitenplatz resembles the centre of a small Austrian village. So what do you need for such a square? 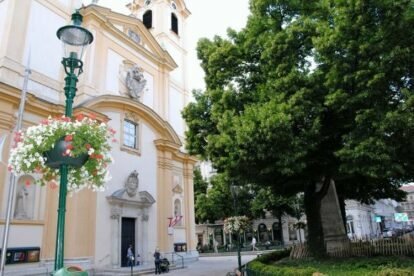 An old church, some benches, huge trees which give shade, a café, a pub, nice stores in the surrounding streets and local people who enjoy it- both old and young. This is what you get here! And that’s why I like this spot. There is the Servite church from 1677, there is a coffeeshop without a name (where you get homemade ice cream in summer! ), there is a pub besides a hairdresser, and there are these nice simple benches where you can watch couples, the old folk chatting or children playing football. In winter time it’s quiet here, but in summer it’s pretty much the center of that quarter. I think every time of the year it’s worth a visit. The sad history of the Servitengasse, leading to the square, is quite touching. Decades ago it used to be a street where many Jews were living (half of the population of the ninth district in 1938 were Jews, like Sigmund Freud who lived pretty much around the corner), but with the Nazi regime they had to leave their flats and homes. A little memorial with all symbolic keys shows the names of the displaced persons. Some sad history for a neat little square.